Follow us from the beginning of our coffee journey. Straight from the farm where our pretty lady coffee (the pet name for our roaster), is nestled ready to play and experiment to get the perfect roast. she happens to be mamma coffees sister. Very interesting human. Humble, genuine, gentle, but wild gypsy soul and passionate at the same time. insight into what it is to be a yoga instructor and what is happening in london to get rid of the catastrophe of plastic waste. Tips, tricks laughs. lekker stuff. From our Death by coffee live hub. Roastery, Bestest coffee and interesting Humans. Honored to be interviewing who is known as Mr Bitcoin Africa, Lorien Gamaroff at our first ever Live Hub Broadcast. 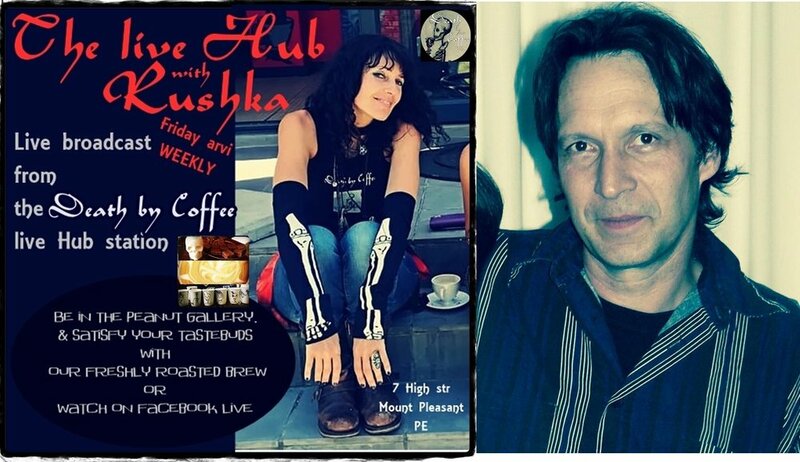 Here on The Live Hub With Rushka broadcast at the Launch of our Live Hub. 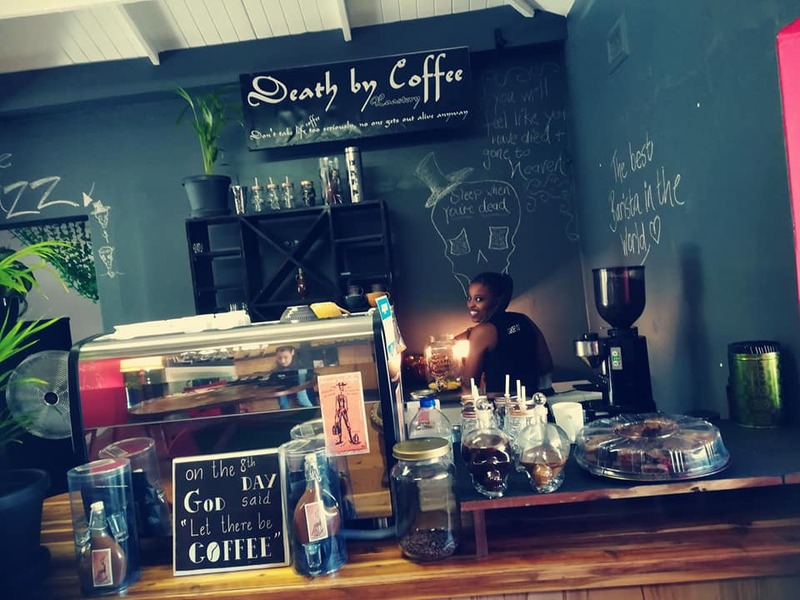 In Port Elizabeth South Africa - powered by Our Death by Coffee. YES we accept Bitcoin Cash as payment and YES we gave some away at the launch. We have launched not only a take away coffee hub but a live podcast and Interview station at the same time. Weekly podcasts with Howard Kleynhans the legend on "the history of music" and the live interviews will be hosted by none other then mamma coffee (Rushka Johnson), herself. Once a week, she will find the coolest most interesting people ever to delve into the depths of their hearts and minds and what they do. Starting with "Block chain africa" the one and only, Lorien Gamaroff, CEO of Banky moon and pioneer in Africa and globally in cryptocurrency and specifically Bitcoin and Bitcoin Cash. (you can watch live at 10am while you drink our delicious cupaccinos). YES we WILL be accepting bitcoin cash as payments (big discounts for using) and even SHOW YOU HOW to set it all up. Gosh! 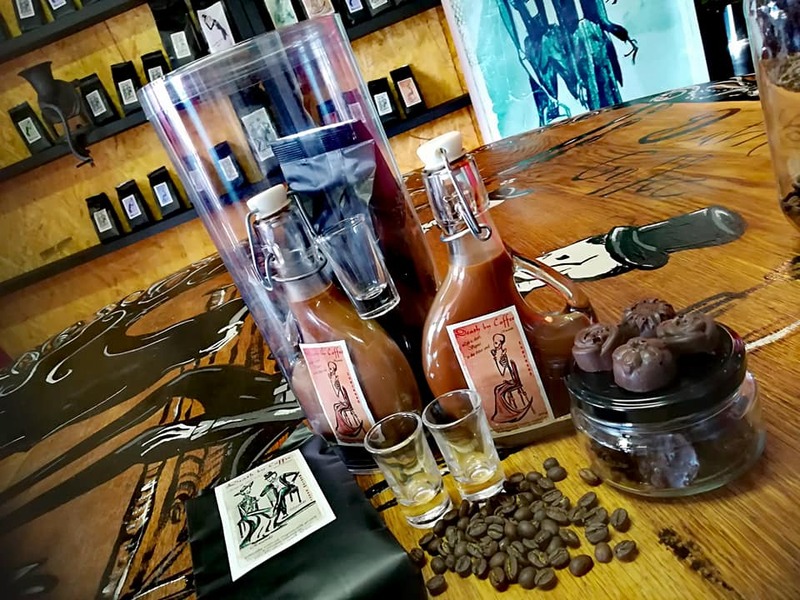 This, we love love - Launched on the saturday and it went like hot cakes (well frozen cakes to be exact) - Can'e believe how much people love love this Iced coffee. We also used our friends and family and unsuspecting visiters as guinea pigs. We had a fat jol testing this one out... Eish, our lounge was covered in bouncing children, bottles, cream, sticky honey and coffee all over the place... Once we had found the perfect balance we were good to go. People are buying it in 6 packs nogal.. We dont skimp on ingredients - best of everything and using all local stuff. Honey from one of my neighbours down the road, milk from local dairies (grass fed without hormones etc) - CREEEEAMMYYYYY and our freshly roasted brew expressed from our beast. Being in the house of coffee we still restrict coffee drinking and remind eachother to always RESPECT THE BEAN - remembering that it IS a stimulant. Boychild and preteen only have twice a week before 12am and Teen before 12 (she enjoys a good cup but not too often) - mamma and daddy coffee - have bumped up to 2 a day!! sometimes when we are bing extravagant we have 3 !! Now you can literally say - "Got the Tshirt"
Choose a design, T style and size and we will courier to your door. Cool pressie for a friend with some of our coffee. We love markets and events - Promoting our coffee, letting you taste its yumminess, meeting new people and hanging with our communities. Death by coffee at the Postively Empowered event. We invented a new bag because we had to but it's so beautiful!! so we are keeping it. Yes we have officially launched ! One must always have a teen who is an artist. Infact the more children and family members with collective and diverse talents and skills the better. Finding the font was fun and asking our friends on social media to chip in with wording and ideas for "their" coffee, even better. Stuck them on (Neil's words playing around in my head, "Stickers must be perfectly straight", don't take out your rulers people, please, (We'll make sure that Neil gets the straightest one, hehe) and played around with our bag sealing machine. Our 10 year old has that part organized. Look and smell delicious. What do you think? As soon as we have our coffee blended and roasted to perfection.. we are good to go. Have some absolutely delicious ones ready and waiting. Tested some on friends who said that they had died and gone to heaven. Very fitting for Death By Coffee. So daddy tells preteen that there is such a thing as cold brew coffee. Yes, brainstorming a zillion different ways to use and drink coffee is most exciting and a hot topic at home at the moment. He proceeds to describe the method used. Slow drip over 24 hours bllaaa dee blaa.. I leave these two chatting, only to return to find the kitchen table and light fitting turned into an experimental cold brew coffee contraption. A bottle, filled with water, tied to the light with some wool, dripping all over the table, (a small fraction met its target, which was noted because of the applause and festive sounds). Through a filter filter cup balancing precariously on a glass bottle. With much practice and placing and water, she managed to create her cold brew. I just left her because it looked as though she was having too much fun, all the while thinking, honestly, what difference does drip filtering make! We live on a small holding and had to "trim" the trees in our street before the truck could get through. Very exciting watching them dismantle the crate (which the kids now use as a playhouse) - yes that's how big it was! And then wheel this beautiful creature down the driveway in pieces. Putting her together was like playing with Giant lego . Thankfully we are a crew of 1 mom, 1 dad, one lego loving boychild and 2 very enthusiastic girls. 2 weeks later the creator of the newest member of our family, came down for the weekend with his engineer for organized play and experiment. The smell alone after a day of roasting was enough to make us realize that we had made the right choice in new adventure. Boychild loved looking, smelling and crunching every now and then on the beans. (10 so too young to actually drink coffee yet but still fancies himself an expert after all of the information and experimenting). Girl teen got right onto drawing up a logo for our brand and girl preteen enjoyed the smell of coffee penetrating every inch of our home.